Note - I am tired of brother wars and just tired all around so here's my take in a nutshell. Dean is right. Sam is right. They both disagree. That's okay because for once the writers allowed them to both be mature about it and I am eternally grateful for that. I live in hope that the next episode doesn't destroy this blessed truce. Now if only the fandom would call one. Previously - Everything is about Amy. I'm glad she's dead. Now I wish she would die. In a hokey séance with all the trappings, a woman asks about Uncle Danny. Candles glow, wind blows, puppies play in heaven, and spirits knock. A medium with Ouija board plays on her emotions while a disgruntled man wants answers. Uncle Danny hid some papers and he wants their location. Money's at stake. As Hokey and Grumpy touch the planchette, lights flicker and even Hokey is worried. This is not part of her act. "Maybe Danny didn't like the question." Ha! The fireplace wooshes and dies while lightbulbs burst. Believer scolds Grumpy but Hokey's a goner. Death by planchette through the throat. AWESOME!!! The title card splat brings us Dean and his carry out from Fat Mack's Bar-B-Q Rib Shack. Flo's joining us this evening - score! The bag even has the same pig as the sign in All Dogs Go to Heaven. Dean checks his messages but no call from Sam, so small time jump. He lowjacks a vintage Dodge in terrible condition but more manly than the bunny stickered mess last week. The front seat is covered in a month's supply of fast food wrappers with fuzzy dice on the mirror. "Geez, have some pride." Ha! An obnoxious DJ informs us two mediums died in New York's Lily Dale, "the most psychic town in America." And we have a case. (Side note - I notice Dabb and Loflin on the credits here and dread watching the episode to go to hell in a handbasket. I needed to look more closely since they only produced, not wrote it. Thankfully.) At Hokey's home business and crime scene, Dean actually wears gloves. Wow! He finds a tape recording of wind under the table complete with volume control, a button on the chair so the curtains move, and a knob for knocking. Guess Uncle Danny didn't stop chasing Sadie in heaven to give Grumpy clues. (Nice shout out to Jared and Gen's dog.) 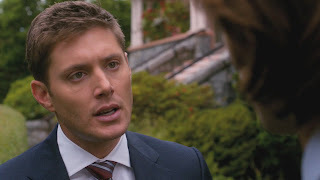 Dean: "Oh spirits of the further, am I going to win the Powerball? (knocking sound) I'm going to be rich." Bwah! Too bad no one's around to appreciate it. Lily Dale is bigger than expected and you can't go 3 inches without stumbling over a psychic. A sign announces their annual Psychic Festival but Grandma Goldy, aka Hokey, won't be there. Watch out, other sign people. Dean enters the Good Graces Café where the daily special is "You!" and the soup is State of Bliss. Not Dean's kind of place. Even I'm getting ill from the goodwill. Host: "You get a free affirmation with every order." Huh? Um, ok. Bwah! Dean is speechless. 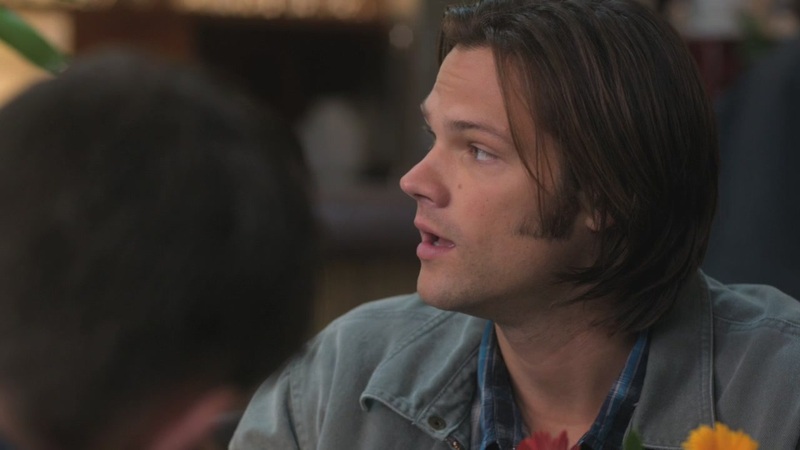 He decides to try the taco joint until he hears Sam talking on the phone and heads over to Sam's dismay. "You always wear a suit to get your palm read." So, Dean's going for the avoidance strategy. Don't think it'll work. Dean chats about high EMF readings, but Sam is silent. He's still ticked; he has a right to be. Dean says Hokey didn't have the mojo to summon spirits and real psychics are rare. Shout out to past episodes. Ah Pamela I miss you. Ugh Missouri, I hope you're dead. Dean asks how Sam's been, as Host takes his order. "You are a virile manifestation of the divine." He's like a creepy, walking fortune cookie. Dean: 'What the hell did he say to me?" Basically, New Age speak for "You're hot," Dean. Sam starts to speak but Dean rudely interrupts him. He's trying to avoid Sam's words, but that won't solve anything. "We're both here, alright. The odds of either one of us leaving while people are still dying out there.." He gestures zero. "You might as well bite the bullet and work with me on this one." Sam doesn't know if he can. 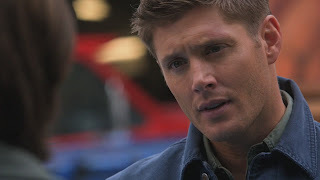 Dean: "I'm not asking you to open up a can of worms. OK, I'm not even asking you where the hell you've been for the last week and a half." Sam says good to Dean's shock. Um Dean, you realize he's royally ticked right? "I'm just saying let's try and stop the killings. That's it." Sam agrees. A woman does a double take; Sam assures her they aren't the serial killers. Dean: "No those depraved killers got put down like the dogs they were. Us on the other hand, we're completely harmless." OK! Thanks Flo for remembering they were the object of a country wide manhunt a few days ago. ScrewLoose gushes, "I can see by your energies you are completely gentle." No psychic points for you. Nikolai Lishin, Russian spoon bender, interrupts. Since he was on the Psychic Festival poster and has talked with Dean and Sam, I put his odds of surviving equal to a unicorn walking down the street. Possible but just barely. He thinks hard at Sam's spoon and leaves. Sam refocuses on the case, and what do you know, poster child #1 (Imelda Graven) was the first victim. "She was brained by her own crystal ball." I'd bet on the unicorn before Nikolai. Dean notices that Hokey and Imelda wear the same necklace and Sam explains that Imelda left it to Hokey in her will. Cursed object? Great throw back to earlier seasons! I like it. Sam puts sugar in his coffee when his spoon bends. "He broke my spoon." BWAH!!!! The brothers interview Hokey's granddaughter Melanie together. She goes the fake psychic route minus set dressing. She reads people instead. "It's just less woo woo, more body language." I like her; she says woo woo. 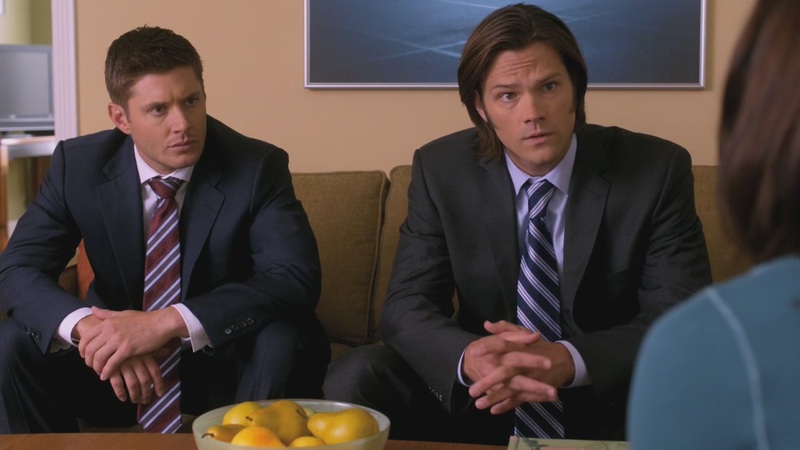 She reads the Winchesters as having worked together a long time, but Sam is ticked and Dean is stressed. "It's not brain surgery." Agreed, the brothers radiate tension. Hokey was a believer, Melanie's not, Dean says he has an open mind, and Sam harumphs. Bet Melanie's mind is more open in 30 minutes. If she lives through it. The necklace is at the Emporium so we head there. The owner, Jimmy Tomorrow (sigh) says emporium; I say pawn shop. He's brilliant too. "You're looking for something." Maybe I should head to Lily Dale to try my hand at palm reading. He calls the necklace the Orb of Thesulah. Say what? A Buffy /Angel reference? 2 weeks late is better than nothing. Jimmy claims it's very rare, which Dean correctly assumes means pricey. "Well in that case, we'll be taking the state's evidence discount." Ha! Sam says it's a murder investigation, "and we'd like to personally thank you for not obstructing." But Jimmy isn't keen to let it go and grabs Sam's wrist. "You know I give personal energetic readings." Creepy. Sam and I can't leave there soon enough. Jimmy states Sam is angry and dealing with loss. He gives Sam his card. I understand Sam's mad - no reason to keep reminding me. Outside Dean says Jimmy "went a little Mentalist" on Sam. Nice catch, Wilson. The reference went completely over my head. Dean asks what the orb of Thessulah is and I raise my hand. "I know. Pick me." Sam's answer is funnier. "I know one thing. It's made in Taiwan." BWAH! "A fake around here. Imagine that." Dean says the medium killer is still out there and we pan on Nikolai's face. Should have bet on the unicorn. 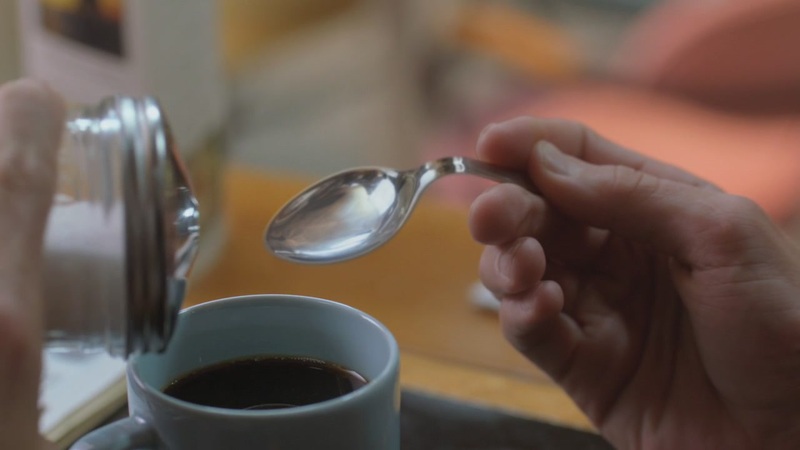 He dumps silverware on a coffee table, waves his hands, and bends a fork, which magically straightens itself. Lights flicker, cutlery stands on its own, and Nikolai falls flat on it. This episode has some cool deaths. On the scene Dean snarks, I laugh, Sam doesn't. Yikes! Sam introduces Dean to the sheriff as Agent Bourne. Better than Agent Smith. The sheriff is delightfully deadpan. "It's a weird one. Chest full of cutlery." I love guest stars who play cops on this show. Still, I'm skeptical he doesn't mention they look like last week's serial killers. I guess Flo's on a snack break. The tip line has 46 calls. Most popular theory? "It's a tossup between a ghost and some sort of ogre that only attacks Russians." Bwah! Dean: "Policing Lily Dale sounds fun." Sheriff: "It's either this or Los Angeles." (Possible Mentalist reference) Ha! I love this sheriff. Sheriff claims it's not all "spirit monkeys". Nikolai had a death vision "cutlery and all". So did Melanie's grandma, who left voice mail predicting her own death. A cold room means ghosts. Melanie freaks that they believe in ghosts. Dean: "Yeah see there's fake woo woo c** and there's real woo woo c**." Dean says ghosts are practically normal. She thinks X-Files but Sam admits they aren't Feds. Melanie: "I need a drink." Dean: "I support that." I laugh but hope Dean remains drink free. The writers oblige. Outside, they theorize that ghosts travel via crystal ball. "Woah, that means that every storefront in town has a ghost satellite dish." Hee. Plus summoning spirits is big business there. Dean: "Yeah dude but most of these guys can't even call a taxi." Love the one-liners! Kudos writers. Sam retorts that someone must be the real deal. Dean is less than excited about Lily Dale. I am less than excited that Sam wants to split up although it makes sense given the long suspect list. Sadly, Melanie's fake psychic friend gets her own death vision after bilking a customer worried her brother is going to jail. She tells the customer not to fret since "family is a pain in the a** anyhow." The anvil of brotherly discord has dropped on my head so many times I have a fractured skull. 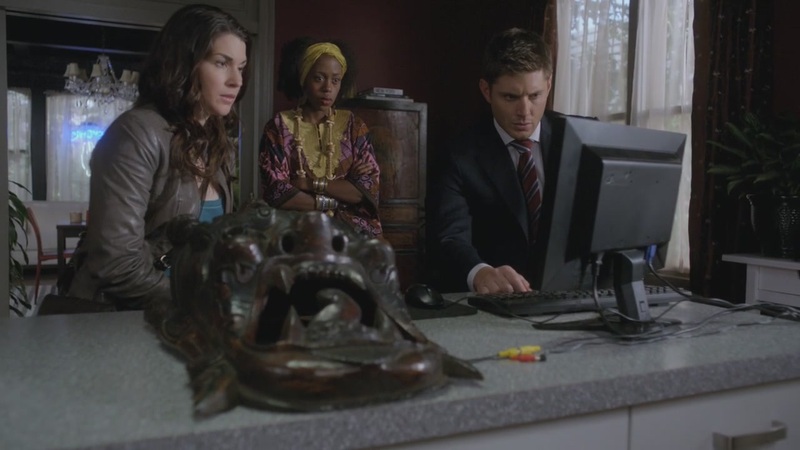 Perhaps Supernatural can spare a fake insurance card? My stomach hurls as she cheesily thanks the spirits right until she says, "Now will that be cash or credit?" BWAH!!! But glowing white eyes kill the mood. Jamaican Phony will die at 2:00 by strangulation. Enter Dean and Melanie. There's no trace of accent when she says, "Phony lawman, huh?" Dean: "Yeah because nobody can relate to phony around here." Ha! She explains her vision and doesn't want to die. Dean says they'll figure it out. I can't figure out why these psychics don't leave. Luckily, Phony tapes her sessions and they see the ghost on computer slow-mo. Dean tells us the ghost gives people visions. I'm suspicious. Why tell people you're going to kill them, then give them time to prepare? Even in the spirit world it makes no sense. Melanie points Dean to the Psychic Museum, where a tour is in progress. Sam scowls at the ectoplasm display; I laugh as the guide says, "Walking, walking" in the background. Loved the tour guide in Long-Distance Call. ("And we're walking, walking. And we're not touching that.") In the Hall of Sibling Acts, watch out for flying anvils. It's like lethal dodgeball in there. Annie was super busy this episode. Guide: "Never ended well for the siblings….the strain of working together, maybe just being around each other all their lives." The one exception was a homosexual couple posing as the Campbell brothers. Egads! Get me out of here before I'm comatose. They get a hit with the Fox sisters, founders of Lily Dale. Kate was troubled and had death visions. Margaret wasn't as talented. "She didn't have her sister's charisma, but she looked after Kate. Sometimes one's true gift is taking care of others." Really show? You want me comatose? Bah! They get cemetery info and I'm as ready as Sam is to leave. Dean goes to join him, but Guide grabs his wrist and gives him a message from Ellen. "She seems quite concerned about you. She wants to tell you, pardon me. If you don't tell someone how bad it really is, she'll kick your a** from beyond. You have to trust someone again eventually." You tell him spirit Ellen! Guide reminds him of the gift shop as Dean is left befuddled. I empathize. Outside, Dean wants to talk but Sam is cemetery-focused. That's a role reversal anvil flying your way. 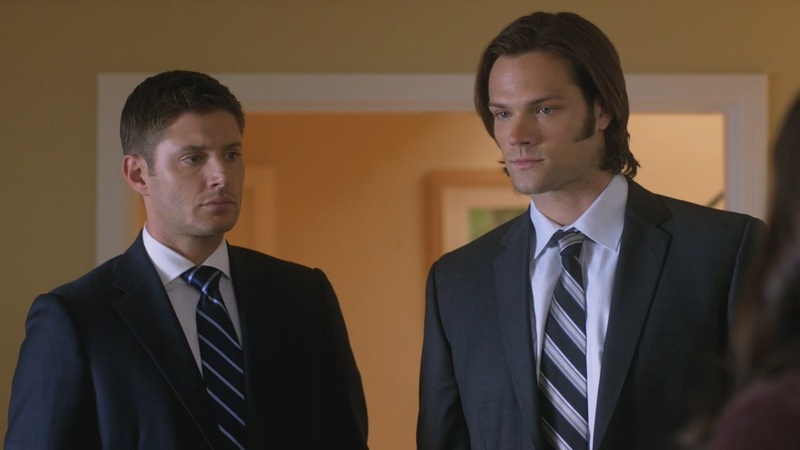 Dean is tired of just the facts and Sam reminds him he agreed to it. Dean: "No we agreed to work the case. We didn't agree for you to be a d** the whole time." Sam's flabbergasted and even after watching this 3 times I'm not sure how I feel about it. "You're p** ok and you've got a right." Sam: "Yeah, damn straight." Dean: "But enough's enough." Sam: "Says who? Look, I'll work this damn case but you lied to me. And you killed my friend." He starts to walk off. Dean: "No, I put down a monster who killed 4 people and if you didn't know her, you'd have done the same thing." Sam: "I did know her, Dean." Dean: "Yeah which is why you couldn't do it. Look I get it. There's certain people in this world, no matter how dangerous they are, you just can't." Sam: "Don't pull that card. That's bull. Look, if I've learned one thing, it's that if something feels wrong, it probably is." Dean: "Usually, yeah. Killing Amy was not wrong. You couldn't do it so I did. That's what family does. They do the dirty work and I would have told you eventually once I knew that this whole waving a gun at Satan thing was a one-time show. I think it's reasonable to want to know that you're off the freakin' high dive Sam. You almost got us both killed. So you can be p** all you want but quit being a b**." Dean walks off as Sam's jaw twitches. [My take: I both fret over and celebrate this scene, mostly since they are both partially right. Still, even with both sides together it doesn't feel like the whole truth. Dean says Sam has every right to be angry and he does. Dean lied to him numerous times. It's even worse because he harped at Sam for not telling about the hellucinations earlier in the season. 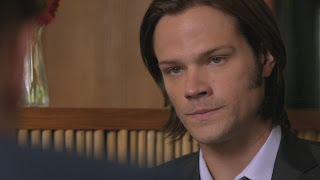 Sam wasn't right about hellucination hiding and Dean wasn't right about Amy lying. Both brothers know lies get you what you need in the hunting world but they have ample proof it doesn't work in their relationship. If lying was the heart of this conversation, then the solution is simple. Dean needs to apologize profusely and sincerely and vow to never lie to Sam again. Sam needs time to build trust in Dean again. 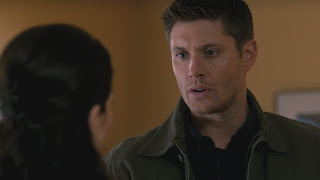 However, this conversation seems to debate whether Dean was right to kill Amy or not. I'm not even a little bit objective about this. Amy needed to die for reasons I shared ad nauseam in the Girl Next Door recap. For this, I celebrate the conversation because it allows Dean to explain why he killed Amy. My first objection is Sam calling Amy his friend. He knew Amy maybe a couple hours as a teen and maybe another hour as an adult, where he had a knife to her throat a good portion of the time. Yes, it was an intense few hours but there's no indication they kept in touch. Sam needed to save Amy because she saved him and he saw himself in her plight. That's not friendship. That's overidentifying. He was desperate to save Amy because he saw her as a person taking control of her life when her nature fought against it. For someone hearing Satan in constant surround sound that's a real comfort and hope. He wanted to believe she could make it because then maybe he would make it too. That's a natural reaction and there's no faulting it, but it does leave you blind to the person's circumstances and nature. The truth is if Amy felt her son was threatened, she would kill again and it wouldn't matter who was standing in the way. She used their brief history as a shield but it wouldn't stop her from killing Sam if she thought Jake was in trouble. 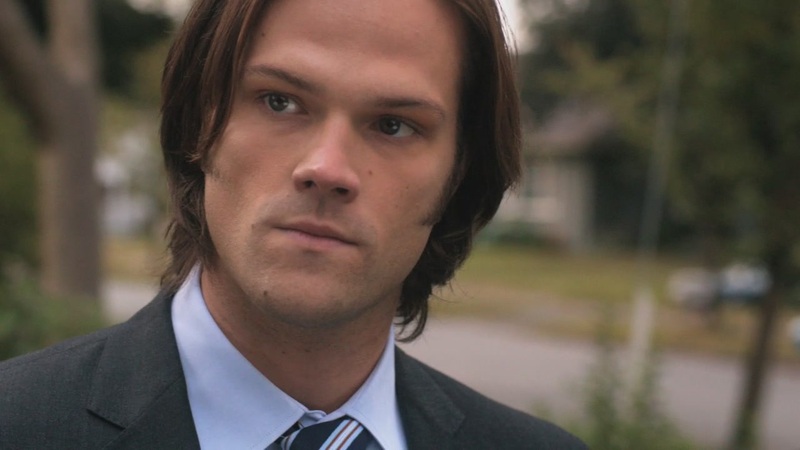 I firmly believe Sam's reaction is less abut Dean killing Amy than it is about him killing the hope Sam had in Amy. She represented a piece of control he had in a dark time and now it's gone. Apparently righteous anger doesn't outweigh saving people so the brothers work a little salt and burn together. Love it and the aerial shot accompanying it! Don't see many of those. Sam breaks open the coffin, puzzling over the same issue I have. "I get why she's killing people. I just don't get why she's warning them." The obvious answer - she's not killing. As every anvil is labeled family dysfunction it must be her sister. Suddenly Kate materializes in the graveyard, pushes Sam down, and tells Dean, "Listen to me. Why isn't anyone listening?" Yep, she's warning people, but try a less cryptic way next time. Perhaps showing them their future death isn't the best way to get someone to trust you. Like we say in elementary school, use your words. Dean: "You don't get a vote." He flicks his lighter but it doesn't work. 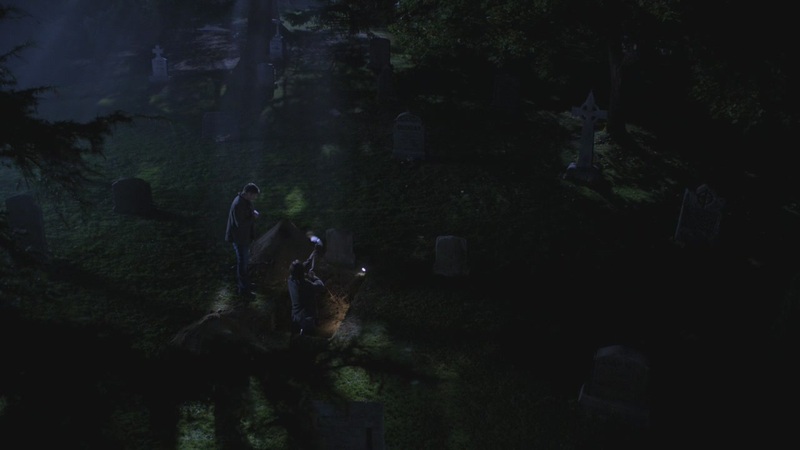 Instead Sam lights a match and goodbye ghost, right through Dean. If this was supposed to be a lesson in how neither brother listens in crisis mode, it went completely over my head at first. I was too happy to see the brothers work in tandem on a common goal after their fight. Perhaps that anvil missed me but don't worry. Dean's phone call to Melanie saying the ghost is gone brings its own foreboding. 27 minutes in and the fake psychic friends decide to go to Melanie's house. Really? You all should be halfway to New Jersey by now. I feel a bit better when Melanie tells her friend to stay with her for awhile, but that relief ends when they pick up her friend's things right at 2:00 am. Could you tempt Fate harder? I swear there's gold threads around somewhere. You couldn't have stopped at a gas station for a toothbrush on your way home? Sometimes PiP's on this show deserve to die. The clock strikes, ghost appears, and Melanie calls Dean frantic. Sam takes the phone from Dean and tells Melanie to get salt. Alas, they run out of salt, Melanie goes down, and Camille can play fetch with Sadie. Dean comforts a distraught Melanie while the brothers exchange looks. The next morning it's Dean who's distraught. "We should have known that whole good sis-bad sis story was just showmanship c**. Oh and it turns out that Kate was just trying to warn people about her evil b** sister and we burned her bones. So that's gone." Thanks for the recap Dean. Writers, the plot's not that complicated. We got it. 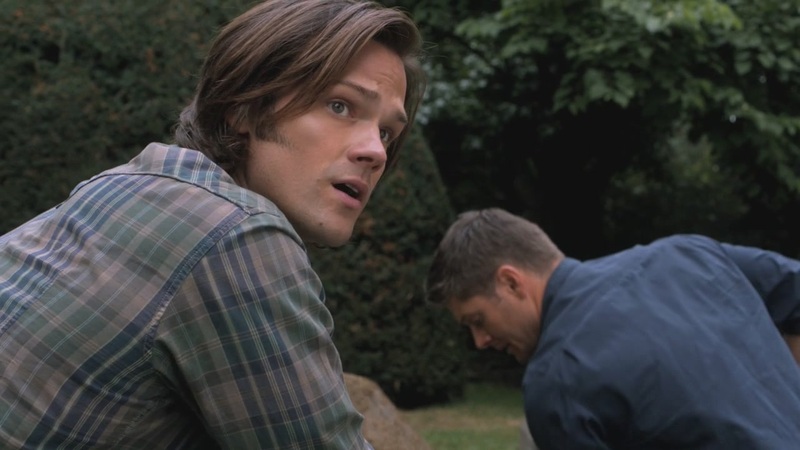 Sam refocuses Dean before the guilt train drops from the sky. "All we can do now is go stop her." Dean says that's not good enough and for once the brothers agree. I sigh. Melanie comes down the stairs and Sam asks, "Can we talk about this later?" I'm excited that he plans on a later. Melanie nicely tells them to leave and I'm frankly stumped by that one. Does she want to die? They look at her with guilt and pity but explain Margaret is still out there and she tells them the only target was Camille and that Margaret is sadistic. We already knew that too. Next up, a daylight salt and burn. Yikes! The brothers really are shaken up by this ghost. Dean starts shoveling. "I feel naked doing this in the daylight." Sam plays look out and agrees. Then they switch places. Dean: "Alright Mags, my lighter's juiced this time." Hard to believe it wasn't last time, but whatever. It doesn't matter since Margaret's bones are missing. Taking someone's bones is used in binding magic, according to Sam. "Great psycho ghost b** on a leash." There's a live person behind this and I naturally suspect Melanie. After all this story is ripe with family issues. Sam suggests calling Bobby but lo and behold, the brothers figure out the motive on their own. Love that! Dean picks up the Psychic Festival flyer. "Hey Sam, you know why I'm not going to spend my money at the Annual Lily Dale ESP Festival and hot dog eating contest this year?" Because you know they're all fakes and you can't use fake credit cards anymore? Just a guess. "Because all of the headliners are dead." That too. Apparently our demon friend Envy has moved to the astral plane. Hokey wrote a book. Imelda was on the Nate Berkus Show. (Had to Google him. He had an interior design psychic on his show. Who knew psychics specialized?) Melanie fills in the blanks; Camille was next in line for the spotlight. Unfortunately, Melanie moves to the head of the line now. Meanwhile Sam heads to the Pawn Shop Emporium with a list of items he presumably got from Bobby. Jimmy asks why him. Sam: "I'm kind of doubting they sell ashwood altars at the Gas n Sip." I kind of wonder if America has Gas n Sips. Midwest folks are partial to QT. Jimmy pulls out a handwritten ledger to get Sam an address. I guess psychics don't need computers. Back at Melanie's, Dean makes up for Camille's lack of salt. The plan - Dean and Melanie stay in the salt circle until Sam burns the bones. I'm nervous about Plan A ever since Jo froze the window and shattered the salt line. Melanie asks if burning bones causes ghosts pain. Neither Dean or I thought about that but he says probably. If we get guilt about ghost pain out of this, I'm dropping anvils on the writers' heads. Melanie: "Good." Guess not. I worried for Dean's safety here even though it's a natural response. The day must have flown since it's night as Sam pulls up at the address. Is it in New Jersey? He kicks open the door, gun at the ready only to find….a Lamaze class. BWAH!!! @_FallingSlowly_ suggested Gen should have been there. I would have died! The woman running the class is none other than ScrewLoose from the café so we are still in Lily Dale. Sam: "You're not a necromancer?" ScrewLoose: "This is a Lamaze class I swear." Ha! Bet she thinks Sam has a screw loose. He leaves awkwardly as we both figure out Jimmy controls things. Glad you're not evil Melanie. Sam uses Jimmy's business card to track him down while Margaret's face pokes through Melanie's window. Yikes! At Jimmy's, Sam finds an altar and picks up the requisite skull. Color me not shocked when Jimmy comes up behind him and plants a pistol in his neck. Guess Jimmy doesn't use a gun much. 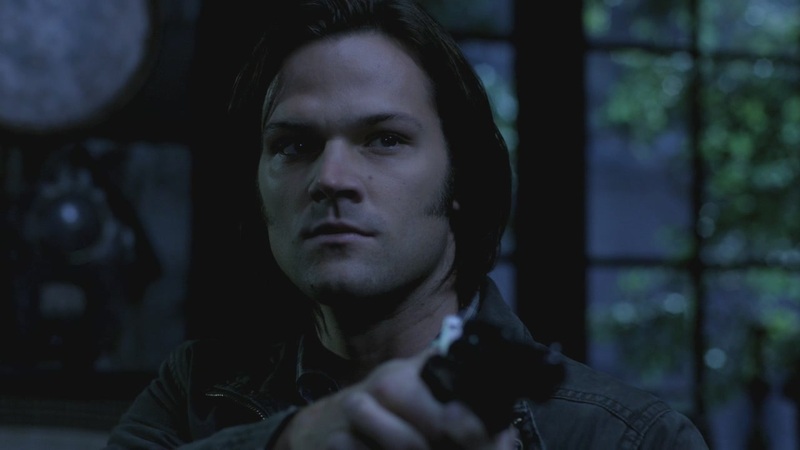 I learned from Dean in Everybody Loves a Clown that this makes it easy for the person to get the gun, which Sam does. Sam dumps the altar releasing the binding spell, but Margaret and Jimmy have a twisted love thing going fueled by envy and crazy. They both had real talent overlooked because of their lack of showmanship. Now that's overidentifying! Margaret blows out the windows at Melanie's and bye bye salt circle. Dean: "Dammit, I hate when they do that." She enters the circle and tosses Dean. Luckily Melanie is ready with iron and Dean with a sawed off. They remake the salt circle in the kitchen but this time Margaret takes out the floorboards. "Oh, sorry handsome." The gun jams so it's iron chains next. Flipping back, Jimmy whines about people not appreciating him and how he can't afford Lily Dale anymore. Shut up, Jimmy. Alas, he is a talented so the gun flies back to him. Sam tries to reason with him about killing innocent people but he's a psychopath. "I live in squalor because I can't put on a show like them." That justifies killing them? How about acting lessons, idiot? Sam realizes the bones are in the bedroom. I realize Jimmy cannot shoot to save his life. When Jimmy looks back at his bedroom, Sam pulls his gun. A second later, the world is freed from one more psycho moron. Good thing because Margaret's kicking the stuffing out of Dean. I'm creeped out by the implications of Sam finding Margaret's bones in Jimmy's bed. This is as creepy as the mannequin scene last year. Melanie chokes, Dean wakes up and Sam salts and burns Margaret's bones in Jimmy's bed. Goodbye Margaret, hello block fire. The bone thing isn't any less creepy in the daytime at the Good Graces Café when Sam recaps for Dean. "I can't believe he was boning her." Sam and I can't believe he said that out loud . Host asks if they need anything else. Dean: "Just a refill and if you affirmate (sic) me, I'm going to punch you in the face." BWAH!!! The guy's face is priceless but there will be no affirming today. "I can't wait to get out of this freaking fortune cookie." Aw, I like this episode far more than I thought I would. Melanie enters. Sam: "I'm gonna, uh, do something outside." Ha! Melanie says thanks and Dean says there's no need. Is he channeling his inner Bobby here? He's upset he didn't save Camille, but Melanie explains that he didn't kill Camille. I hope Dean gets that too. She notices Dean and Sam are doing better and the second half of the episode highlights that. Melanie: "Wish we'd met on a better week." Dean: "I wish I had better weeks." Aw. They chat about maybe meeting again but a palm reading can't clear it up and I would find it extremely odd if they did. She's not psychic, doesn't hunt, and I doubt she's a big source of information so what's left for her to do. Dean meets up with Sam packing his things in NotPala's trunk. This is a good sign. Sam: "I figured we'd take one car." I like this plan. Dean: "Works for me. You still want to break my face." Nah, that scene has passed. Sam grins. "Not at this moment. You know what, um, you were right about Amy and if she was just any monster, I'm not sure I could have let her walk away. I don't know. I mean, I'll never know." I'm happily floored by the chance of a mature brother conversation on their differences. Do not blow this Dean with humor. "So what are you saying?" Sam: "What I'm saying is I get why you did it. You were just trying to make sure no one else got hurt. But here's the thing, you can't just look me in the face and tell me you're fine. I mean you're not sleeping, you drink for the record.." Dean interrupts, "Oh here we go" and I have an intense desire to kick him. DO NOT BLOW THIS DEAN!!! Sam: "Look whatever, last one to preach I know, but just be honest with me. How are those the actions of someone who knows they did the right thing?" Awesome Sammy. Just awesome. Do not stop until you get an answer. Dean: "You want me to be honest?" Sam: "Yeah." Dean: "I went with my gut and that felt right. I didn't trust her Sam. Of course ever since Cas I'm having a hard time trusting anybody. And as far as how I've been acting, I don't know. Maybe it's because I don't like lying to you. You know, it doesn't feel right. So yeah, you got me there. I've been climbing the walls." Hmm, is something else going on Dean? The side look down doesn't feel right and I don't want any more surprises. Please let that be only guilt. Sam: "I know how that is." Dean nods. Sam: "But hey, if I learned one thing from that museum, sibling acts are tough." Dean: "Uh. Don’t compare us to that hall of crazy. We're like poster kids of functional family life compared to that." Dean I tried not to compare but all those anvils left a deep impression in my cranium. Sam: "That's a low bar." Ha! So true! Dean: "Well hey, grading on a curve has gotten me past everything since kindergarten so don't knock it." Sam agrees as the brothers enter NotPala healthier and maybe a bit happier. I know I'm a whole lot happier now that they've talked about Amy like adults. Sam: "I still want to know how the guy bent my spoon." Dean: "Forget it Sam. It's Lily Dale." The brothers smile together and they're off. Review - After a second watch, I decided I really like this episode. It's strengths outweighed it's weaknesses, which are more annoying than insurmountable. The end all and be all is the brothers back together again. Yes, it was too simple and I don't think we're done with their trust issues. I have a feeling these will chase us the entire season. However, I'm greatly relieved by this new step toward maturity they've taken and I swear if the writers ruin it next episode I'm going ballistic. They've finally gotten to a point where they can have differences and be annoyed and still communicate in a healthy way. It better last. I also thought the humor was spot on this episode. The one-liners flew and reminded me of season 1 wit. In fact much of the episode did, showing that new kids, Ben Blacker and Ben Acker, obviously did their homework. Love how they respected the show enough to do so. The ghost story, salt and burns, actual investigating, smart brothers, and even Melanie all brought me back to a time when Supernatural was simpler and yet the relationship itself has never been more complicated. I like how the story didn't overshadow the characters. A complicated plot line would have lessened the punch so I'm glad they took this road. Still I hated the return of Wincest throwaway lines; they need a good salt and burn. I also have a problem with all that anvil dodging. Otherwise it's in the win column. So far season 7 is shaping up to be better than seasons 4, 5, and 6 for me. Next week - Sam heads down the aisle and I fear Becky's return more than any Leviathan to ever escape Purgatory. Worst surprise: Freaking Wincest line. Best line: "He broke my spoon." "It's just less woo woo, more body language." "We'll be taking the state's evidence discount." "Their spirit monkey said so." "If you affirmate me, I'm going to punch you in the face."